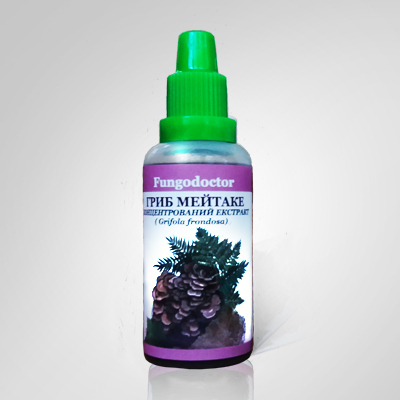 Mateake fungus extract (Grifola frondosa), propylene glycol auxiliary. Homogeneous transparent liquid for internal use of light brown color with a weak specific odor. It is allowed to form a small amount of sludge at the bottom of the vial. The composition of the extract: contains the polysaccharide β-glucan, which has a unique spatial structure - β-l, 3 / l, 6-D-glucan, which received its own name griffolan. The extract contains proteins, glycosides, phospholipids, amino acids, melanins, antioxidants, vitamins of group B, PP, D, microelements (Zn, Se, P, Na, Mg, Ca, K), mineral components. Due to careful processing in the production process, all the valuable substances that make up the fungus are stored. It activates antitumor immunity, inhibits angiogenesis (development of blood vessels), stimulates apoptosis (destruction) of cancer cells, has anti-metastatic effect, significantly increases the efficiency of radiation and chemotherapy and reduces the pain threshold, which is successfully used in the complex treatment of benign and malignant neoplasms, including malignant blood diseases. Has a so-called. organospecificity, which manifests itself in the therapy of breast, uterus, ovary, prostate, bladder, thyroid cancer. According to the latest data, the effectiveness of the meytake extract in these cases in 20 is 28 times stronger than extracts from other medicinal mushrooms. Suppress the action of carcinogenic agents that enter the body together with food, air, water, in the production environment, eliminates the side effects of radiation and chemotherapy. Has regulating and normalizing effects with various endocrine disorders in the body (hypo- and hyperfunctions of endocrine glands). Normalizes the level of glucose in the blood, restores the sensitivity of cells to insulin, which makes it possible to use the fungus in diabetes mellitus 1 and 2 types, thyroid dysfunction and other endocrinopathies, is used in maintenance therapy with menopausal and premenstrual syndromes. Powerful detoxification and immunomodulating qualities make it possible to apply the extract for immunodeficiency syndromes, homotoxicosis and chronic fatigue. It is able to bind low-density lipoproteins (containing large amounts of cholesterol), which have a damaging effect on the wall of the arterial vessel, followed by the formation of an atherosclerotic plaque, participates in lowering blood pressure, which is useful in diseases of the cardiovascular system (arterial hypertension, atherosclerosis, high blood cholesterol , ischemic heart disease, encephalopathy). Optimizes the metabolism of lipids, stimulating the cessation of fat accumulation in the liver and tissues, reduces their number in blood plasma. It is able to destroy adipocytes - fat cells with a pathological increase in their number and reduce weight due to the normalization of hormonal and metabolic processes, is effective for obesity and excessive body weight. Glaucans meytake restore the levels of transaminases, bilirubin when they are raised and normalize the synthesis of bile acids, which is used for liver diseases of an infectious and toxic nature, liver cirrhosis in the initial stage, diseases of the pancreas. It has antiviral, antifungal and antibacterial properties, it has a harmful effect on hepatitis C and B viruses, it can increase the effect of antibiotics, and even forms of bacteria and fungi previously resistant to therapy can be destroyed. It is used in the treatment of infections caused by viruses (hepatitis, smallpox, respiratory infections, chicken pox, influenza, shingles, herpes, poliomyelitis, rabies, haemorrhagic fever of ebola and HIV), pathogenic cocci, E. coli, mycobacterium tuberculosis, isherichia, mycoplasma, etc. , also with fungal lesions (candidiasis, etc.). 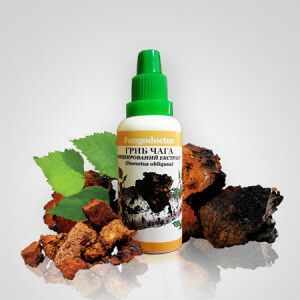 It is included in the treatment of diseases caused by protozoa (leishmaniasis, malaria, giardiasis, toxoplasmosis and others). 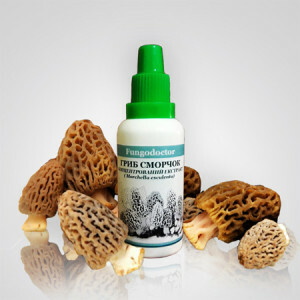 Promotes strengthening of bones, therefore it is recommended to the elderly. No toxic toxic reactions were detected. Storage conditions: store in a dry place protected from light and out of the reach of children at a temperature from 0 to 25 C. Shelf life is 2 year. Do not use the drug after the expiration date indicated on the package.